1. The World’s End is a challenging film that’s already well on its way to being misunderstood. I myself got it entirely wrong on my first viewing, after which I concluded that it was the simplest and weakest of Edgar Wright’s movies to date. After a second viewing, I can see more of the film’s intricate design, and now think it might be Wright’s most complex work, and possibly also his best. But this is a film all about returning, and the minutiae are there. They’re just invisible on a first viewing. 2. 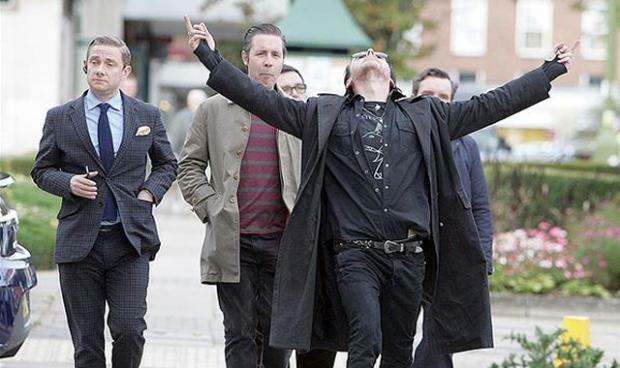 The World’s End is indeed a soberer film than its predecessors. This isn’t a problem, though, because the film, while comedic, isn’t ultimately a comedy. Wright & co. do try to alter our expectations. Consider the opening narration, in which Gary King triumphantly recounts a twelve-tavern pub crawl that he and his mates attempted in 1990. Although they conked out nine pubs in, King proudly pronounces the night the greatest of his life. And for King, that’s true: beer is the world’s end. But what if it turns that out one can? What happens if we take Gary King seriously? 4. The film’s plot kicks off when King escapes from the center in order to reassemble the old teenage gang. Peter, Oliver, Steven, and Andy’s respective surnames—Page, Chamberlain, Prince, and Knightley—provide the first indication that there might be some merit to King’s decidedly anachronistic ways. Viewed one way, King is a drunken fool, unable to escape the past and desperate to get sloshed. But viewed differently, he is a king summoning his once-loyal retainers to join him on a new quest, a return to the taverns of old, where they will reclaim their past glories. Understanding this doubleness is essential to reading the film properly. 5. To reiterate: the mistake I made on my first viewing was to view the film as the third comedic installment in the “Three Flavours Cornetto Trilogy”—an equal companion to Shaun of the Dead and Hot Fuzz. But that’s not what The World’s End really is. In Shaun of the Dead, Shaun ultimately shapes up, takes responsibility for his life and wins back his girlfriend, Liz. In Hot Fuzz, Nicholas Angel learns how to relax, makes a new best friend, and comes to appreciate his reassignment away from London. But The World’s End doesn’t function the way the other two did, and I don’t think it wants to. It’s an ending. It’s The End. Accordingly, Gary King doesn’t change, growing toward others in order to better fit into society. If anything, he remains resolutely maverick the entire film, as society changes around him. And if he is happier and healthier by the film’s end, it’s because he finds himself in a very different world. Again, the film isn’t coy about any of this—it references King Arthur, for instance, and its setting descends from and fetishizes the medieval. What prevents our reading the film as a medieval tale, however, is how easy it is to dismiss King as a serious character. The movie doesn’t paper over the fact that he’s an egotistical, embarrassing drunk, a crazy boozehound with delusions of grandeur who annoys his friends just as much as he amuses them. But what if, at the same time, King is something more than that? 7. King—aided in part by drinking—sees a different world than everyone else does. For him, a beer named “Crowning Glory” really is a crowning glory. Tonight, we will be partaking of a liquid repast, as we wind our way up the golden mile commencing with an inaugural tankard in the first post, then on to the old familiar, the good companion, the trusty servant, the two-headed dog, the mermaid, the beehive, the king’s head, and the hole in the wall for a measure of the same—all before the last bittersweet pint in that most fateful, the world’s end. Leave a light on, good lady, for though we may return with a twinkle in our eyes, we will in truth be blind—drunk! It’s the name of the final pub on the crawl. It predicts the direction the film will ultimately take: this is a film concerned with the end of the world. Note how at the start of the film, the literal meaning is the pub’s name, which is only metaphorically named after the apocalypse. However, by the movie’s end, the metaphorical meaning supplants the original literal one (which burns away). We might also say that the film’s title is ultimately predictive. So, too, is King’s speech. During the car ride to Newton Haven, he says (paraphrase), “There should have been Five Musketeers. That way, two could’ve died, and there’d still be three left.” This of course comes to pass. (Has the King decreed it?) Later, when the gang pauses on the road overlooking Newton Haven, King instructs everyone to “gaze upon it in its original colors, for tonight we paint the town red.” Well—see the ending! The companions fall off the crawl in the same order they did the first time around (only now they’re replaced by blanks). During the first crawl, when the gang got to the smokehouse, they smoked pot, after which everyone grew paranoid. This time, when they reach the smokehouse, they grow afraid of one another, no longer certain who’s human. The three surviving companions finally reach the hill overlooking Newton Haven to witness a new sunrise. The film trades constantly in polysemy, especially by means of punning (which is another reason why it requires multiple viewings). We’re so young and so gone, let’s chase the dragon from our home! Once again, the language is predictive. 12. This reuse of language, the continual infusing it with new meanings, syncs up nicely with another formal aspect of the film: the tension between stasis and change, epitomized by return. The film begins with King’s desire to return home, to return to the past, to return to his youth. This turns out to be an old theme: the return of the King. But although he’s the most obvious example, King isn’t the only one who wants to remain in the past. As the film progresses, we see that, despite their outward signs of adulthood, the other principal characters haven’t grown up all that much. Steven, for instance, is preoccupied with keeping fit, and quite proud of the fact that he’s dating his 26-year-old fitness instructor. Meanwhile, he’s still in love with Sam, the woman he loved as a teenager. Similarly, Peter remains a coward, working at his dad’s new car lot, hiding from his wife and children behind the morning paper the same way he once hid from bullies in the toilets. And Andy has spent the past 19 years unable to forgive King for an accident he instigated, since which time Andy has been teetotal. I believed that because I had obtained a wife who was made up of wife-signs (beauty, charm, softness, perfume, cookery) I had found love. Brenda, reading the same signs that have now misled Miss Mandible and Sue Ann Brownly, felt she had been promised that she would never be bored again. Even the Network turns out to be obsessed with preserving the past. Its blanks can never be truly defeated, since they return ad infinitum, rejuvenated, with no sign that their body parts were severed or smashed. King, by way of contrast, refuses to hide his innermost desires; he remains decked out in a trench coat and a Sisters of Mercy tee. “You haven’t changed a bit,” the others tell him. “But I still like the Sisters of mercy,” he protests. Viewed in this way, he’s the only honest one in the lot. But that’s what makes one a king. One is born to royalty, and cannot stop being such. 13. Note, however, that the film’s structure, while cyclical, is not entirely repetitive, because its components change each time they recur. Even King understands this: he returns to Newton Haven in order to change things—to finish the failed pub crawl. Meanwhile, others comment on how the town, while in some ways the same, is also different. And while key story events recur—King’s attempt to shag Sam in the loo, the appearance of “the marmalade sandwich,” King’s punch at a bathroom wall—it all goes down differently this time. The film’s larger patterns of repetition function the same way. The film closes similarly to how it began: with a narrator sitting in a circle, telling others what happened on one fateful night. But in the end, it’s a different narrator, a different circle, and a very different recounting of what actually happened. 14. Initially, I didn’t understand why The World’s End seemed to be cribbing at times from Shaun of the Dead and Hot Fuzz. King’s desperate attempt to reach the final pub, I thought, recalled Shaun and his friends’ attempt to reach the Winchester. The conspiracy of Newton Haven was a tad too similar to the sinister plot lurking at the heart of Hot Fuzz. And I thought that those retreads made The World’s End the weakest of the bunch. But now I can see that the repetitions are deliberate, and essential to the film’s (and the trilogy’s) design. A case in point. Pierce Brosnan’s character, the patronizing school teacher Guy Shephard, might seem at first like just another version of Timothy Dalton’s smarmy Simon Skinner. And . . . he is, and he’s meant to be. Just think about it for a second. What does the Network do? Well, it replaces you with a younger version of yourself. And what famous character did Brosnan follow Dalton in portraying?
. . . That is how clever Edgar Wright and Simon Pegg are. They are indeed reworking material from the earlier films—and from other earlier films—but they are repurposing it. The Network and its blanks recall Invasion of the Body Snatchers and John Wyndham’s The Midwich Cuckoos. There are overt references to Casablanca and Aliens. Peter’s attack on the bully with a tree branch is a clear reference to the “damn good thrashing” that John Cleese gave his stalled car in Fawlty Towers. The ending around the campfire hints at the ending of Mad Max 2. And, of course, the film ends with a loving nod toward Star Wars (the bartender won’t serve robots). This aspect of the film—what we might call its nostalgia—would prove problematic if we read the film as a critique of not growing up. But I hope that I’ve been able to show here how the film is not simply saying that—or not only saying that. 16. Certainly King is not an ideal protagonist—in fact, he’s pretty pathetic, for the most part, for all the reasons already detailed. Watching him fumble around, I think we find ourselves hoping he really will grow up and join society (as others don’t refrain from advising him). 17. But is the answer to the Network simply individualism? I don’t think so. For one thing, we’ve already seen that Gary King’s hedonistic assertion of self isn’t all that wonderful. The answer has to lie somewhere else. This is where we can try bringing together the film’s structure with its detailed critique of the self. Gary King doesn’t want to play by the modern’s world’s rules. But at the same time, he isn’t just playing by his own. He abides by a code: the code of companionship, of loyalty. His morality is arguably a medieval concept: the group identity of the band. Without his fellows, he’s lost—the archetypal melancholy wanderer of Anglo-Saxon poetry. But once everyone’s been reassembled—”Even Andy?” “Of course Andy!”—then King has a purpose, as does everyone else. King is using the royal we, and speaking for all of his companions (his party). The World’s End, then, is an attack on the modern world, and a model of adulthood that necessitates replacing authentic youthful companions with corporate ones—friendships born out of career advancement, and the outward signs of progress, rather than genuinely liking someone, and therefore protecting them. 19. While the film doesn’t condone drunkenness as a solution, it also complicates what it means to be sober. When King first gathers up his friends, they are awkward, stiff—even hostile. Their politeness toward one another is the politeness of networking (they even exchange business cards, not unlike Patrick Bateman and his colleagues). But as the crawl progresses, everyone loosens up, becomes jovial—more likeable. 20. So if the film is an elegy for lost time (and it is—as King puts it, “It never got better than that night!”), then it’s an elegy for the authenticity of childhood. King doesn’t want to sober up, and that is indeed sad. There’s something pathetic about the guy who’s greatest night was some drunken teenage night. But at the same time, King stands firmly opposed to the phoniness of adult life—to the pretense of appearance. That is the way in which he’s heroic: he’s the only one who calls out getting older as “a big lie.” He’s fearless in his honesty, wearing his devotion to his childhood passions proudly. 21. This is why the Network can’t seduce King. It offers him exactly what we might think he wants—“The chance to be young again, with selective memories”—but King already has that. 22. The film is open in its fear of aging. Newton Haven’s gang of five taciturn youths obviously represent replacements for King and company. Elsewhere, characters and places are bought out, Starbucked, replaced by the Network. The Network also reveals that it’s behind the past two decades of technological progress—and I think we’re meant to think of planned obsolescence essential to that technology (or at least the business model that’s driving it). 23. King’s final response to the Network is to behead his would-be usurper: “There’s only one Gary King!” Following this, he is addressed by the Network as “Gary King of the Humans”—he’s finally recognized as majesty, and thereby becomes entitled to speak for everyone (which he does). 24. The end of the film sees the arrival of a second Dark Age—not necessarily a return to the past, but definitely an interruption in the Modern idea of technological progress. Time goes backward to go forward (just like King and Sam and the others do when driving away from the explosion). 25. A second Dark Age, or an Era of Authenticity Regained? It depends on how one looks at it. This ending neatly inverts the film. At the outset, King was the man out of time, living an unsuccessful, medieval life in the modern world. But in this second Dark Age—when all humans have been left to their own devices—we see the others attempting to live modern lives in a medieval world. Oliver remains a realtor—he’s even depicted showing a house to the same couple from the beginning. Steven builds a (drafty) new house. Peter and Andy reunite with their (nuclear) families. Only Gary King thrives in this new environment—not because he’s changed, but because the situation has. The past overtakes the present and becomes the future, the proper place for one such as him. Given the proper sunrise, he finally finds himself free to do what he wants to do, in all his sober glory.